Estimate or Repair Order parts accuracy? Cost recovery and parts profitability? 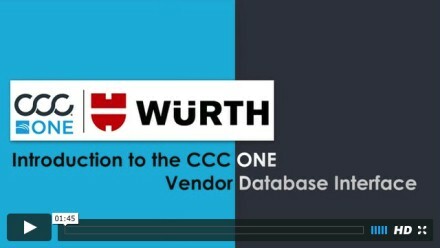 Now you can with the new CCC One and Wurth USA SIS integration! Accounting for all of the on-hand supplies used while repairing a vehicle on an estimate can be cumbersome and imperfect. Now, repairers can better manage their time while making sure they get paid for the supplies they use. The electronic interface automatically includes the supplies you need on the estimate, eliminating rekeying and reducing the need for supplements. Collision repairers will enjoy more accurate and efficient job costing by automatically and electronically importing the Würth supplies used for repairs to the appropriate CCC One repair order. Harness the power of the industry’s leading invoicing and material management package. Now you can easily improve accuracy, increase aftermarket parts performance and boost profitability with the new CCC One/SIS integration! For more information, please contact your local Würth or CCC representative, or call 1-800-526-5228.